Text: Shinichi Tateyama (Blackwater Design) is located in the Kashii district. Coordinated by architect Isozaki Arata, Nexus World was constructed in 1991, consisting of apartment complexes designed by 6 internationally acclaimed architects to showcase uniquely designed apartment buildings. The “Nexus” is named after the city development project in Momochi, the west part of Fukuoka, as a part of the water-front development plan of Fukuoka. 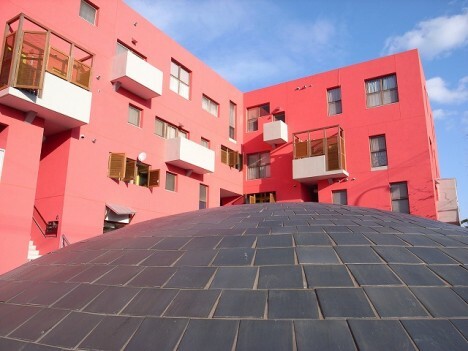 As you walk up to the apartment buildings, you will first see the complex designed by Oscar Tusquets. Two different complex buildings connect together with a gate. It is designed in the post modern style with classic details to make it chic using a light brown base color. There are some windows made with stained glass. Behind the Oscar Tusquets complex is the one designed by Christian de Portzamparc, who designed a white facade which gives a feel of modernism. People will be surprised by the minimal exterior and rhythmical harmony of the openings. This complex consists of 4 buildings including a premium white main building. One of them is designed in a concrete building with black granite in a large courtyard and the other is like a crow’s nest. Both are connected with a bridge, which gives an accent to the complex. 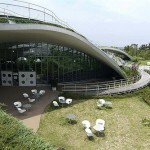 What you will see next is the concrete building complex designed by Osamu Ishiyama. As you look up, you will notice the wall is slightly constructed at an angle. Built spread like a fan, the complex is uniquely designed with randomly projected-out balconies and roofs. Simple yet dynamic buildings look unexpectedly comfortable to live. The very colorful one is the Mark Mack complex. It is interesting to see the color pattern of yellow and red. The ground floor is used for shopping tenants with more space for pedestrians. The use of colors and open space on the 1st floor reminds me of “Unite d’Habitation” by Le Corbusier. The highlight of Nexus World is the Rem Koolhaas complex. With a black stonewall-like facade on the upper part, the apartment looks like a fort with few openings. Opposing to the “luxury” design, the complex has its distinct texture using stonewall-like paint for the facade, and many fence nets for handrails and fences. A long slope designed toward the entrance on the 2nd floor is one of the signatures of Rem Koolhaas who often takes advantage of using the level differences. This complex gained much attention as his first housing project, and still looks keen. Next to the Rem Koolhaas is the Steven Hall complex, where the 2nd floor and above are built in the comb structure with tenant space on the ground floor. There is a shallow water pool designed on the rooftop of the 1st floor. Beautiful and sophisticated housing complex with minimal design and randomly arranged window openings. Surrounded by Nexus World, the Nexus Kashii Central Garden contains 4 buildings, which feature facade designs supervised by Arquitectonica and landscape design by Martha Schwartz. Lastly, the only high-rise at the site, Nexus Kashii Westside Central Tower. The primary plan was to build twin towers but it turned out to be only one because of the budget squeeze. The Nexus World gives opportunities to change lifestyles with keen designs created and offered by the leading architects in the world. Many of people would like to live in this kind place once in their lives. Realizing ideas by the notable architects, the Nexus World should be the most rare housing building in the world.